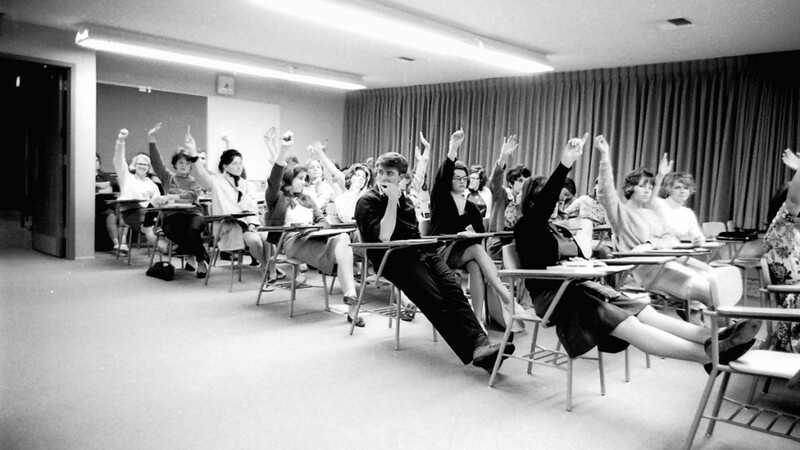 Students raise their hands at a town hall meeting in 1965. Students have had a participatory voice in governance since the College's founding. Pitzer’s system of highly participatory College governance makes it virtually unique among American colleges. Faculty, students, and staff serve together on nearly all standing committees, including those that deal with the most vital and sensitive issues of the College community, as well as on College Council, Pitzer’s primary legislative body, which votes on policy recommendations forwarded by the faculty as well as committees. This system of governance is one of the highest expressions of the College’s founding idea of participation and community, and offers members of the College community an active role in setting institutional priorities and shaping academic and student life. College Council has the power to recommend requirements for academic degrees and honors, as well as make recommendations to the President regarding the establishment of academic divisions and the creation of standing and ad hoc committees. The President or the Dean of Faculty presides as the Chair at Council meetings. Council meetings occur several times each semester and may be convened at the call of the President, the Dean of Faculty, the Chair of the Faculty Executive Committee, or the Student Senate Chair. All faculty and student voting members are expected to attend such meetings. The College Council has the power to recommend requirements for academic degrees and honors, as well as make recommendations to the President regarding the establishment of new academic divisions and the creation of standing and ad hoc committees. The President or the Dean of Faculty presides as the Chair at Council meetings. Council meetings occur several times each semester and may be convened at the call of the President, the Dean of Faculty, the Chairperson of the Faculty Executive Committee, or the Student Senate Chair. All faculty and student voting members are expected to attend such meetings. Committees are the building blocks of College governance: faculty, students, and staff serve together on nearly all standing and ad hoc committees. Standing committees are responsible primarily for the formulation, review and implementation of policy relating to the educational program and student life. In most instances, policy decisions of the standing committees are made in the form of recommendations to College Council, which is the primary legislative body of the school, made up of the faculty, staff representatives and 16 student representatives, eight of whom are elected by the student body and eight chosen from the student members of the standing committees.